The Opinionated Pussycat: It's Sneakers Wonderful Life! Welcoming a New Member to the Family: A 2nd Stick! Miss us? Sorry for being away for a month! Sneakers the Texian Tuxedo, here, with big news! As fans of our and Daddy Kiril's blog know he is a walker and explorer. Not having a car he walks, bikes and uses mass transit to get around. For years he carried around an adjustable metal camera monopod walking stick that allowed him to take photos that he could appear in when inspiration hit. A month ago Elvira shared the news and photos about daddy getting a new stick. The stick was named after our beloved Mr. Nikita and we welcomed it into our lives. All went well for a while then the poor dear had an issue that could not be fixed. Daddy could keep the original as an art display piece (with the right display case if he can find one), even use it as a prop in photos and the new one would be sent at no cost. As you can tell, by looking at the photos in this post, the natural coloring of the stick is different and flashier than the first one and the artwork is different and colored differently, than the first stick, as well. Until he remembered a little prop he had! One that has been used by me since I was a kitten! The mini Stetson would now be pulling double duty! Was I a little jealous? At first, but the more I thought about it the more I cottoned to the idea, especially since we are going to be a creative team finding new ways to make this blog special and hopefully attract new readers. So what is the name and how did Daddy Kiril come up with it? Yes, this photo is almost 3 years old to the day, but what happened yesterday WAS funny...to me anyway, hee, hee! 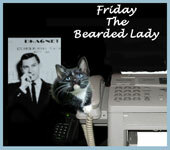 Sneakers the Texian Tuxedo, here, and this is an amusing follow-up to the Blue Norther post and photos, from a few days ago, by Elvira Mistress of Felinity. You may remember that she was NOT happy about how damn cold things have been. Despite a bit of warming....she still isn't. We all like how Daddy Kiril has left his blankets on his Futon, but sometimes things can get a little, um, feisty, when 2 of us, or all 3, maneuver for the best place to stretch out for a snooze. Our window screens have taken a beating for months. Yes, The Texian Tuxedo appeared to be living in a dump. The parties responsible for this sorry state of affairs were several of the stray cats that call our apartment complex home. One of them, making late night rounds, would see one of us, or more, sitting in the window and hop onto the fan box and open a discussion about the issues of the day in the news and we, good ConservaPussies that we are, would try to educate the poor dear. This would set our visitor into a rage and the claws would come out and the poor dear would start mindlessly hissing, yowling and swinging until Daddy Kiril woke up and came to the window to end the show and chase the misguided soul away. The past couple of months, or so, the visits appeared to have stopped so daddy finally requested replacements. Singin' do-wah diddly-diddly dum diddly-meow. Then she meowed a little more. That we’d do as we grew to know each other. Every day we have a good time. Sneakers Gets Her Tongue Shot! Now What? Good morning felinity assembled, Sneakers the Texian Tuxedo, here. We are camera friendly critters around here. Our selfies, whether taken on Sunday or any other day of the week have often led to quite surprising and unexpected results. Some are not even discovered until Daddy Kiril takes a look at the shot immediately after afterwards, or hours or days later. A few special ones are surprisingly artsy whether taken on a Caturday or not, and have been put to use for special purposes on this blog over the years. Mr. Nikita's was the first such shot...He was unexpectedly caught with some kibble in his teeth and was trying to dislodge it. Elvira was just being silly and didn't expect her sticking her tongue out was caught on camera. 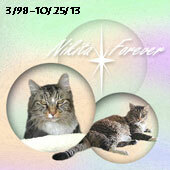 Nikita and daddy eventually found a use for his photo as the first Feline News Network badge. Elvira and daddy eventually decided her shot was perfect for one of the sections in her Elvira Factor posts: the Knucklehead of the Week. It has been a year since Elvira last did the Factor, not having done a regular Factor post in a year (only a special Sparkle Tribute, last August) and she wants to return to doing them, but has little idea what anyone thinks of them. That brings me to, well, ME! So Daddy Kiril tossed us in our carriers (with Elvira being her usual difficult to catch self) and took us on the bus to our vet. We both enjoyed the trip, once in our carriers, a trip that now takes 3 buses, over an hour, instead of 1 bus and a short walk in the same amount of time. When we get to the vet, though, I have always been a little, shall we say, "difficult", leading the vet and assistants to use a blanket to contain my crankiness. This trip, though, I outdid myself. Good evening, felinity assembled, Sneakers the Texian Tuxedo here! 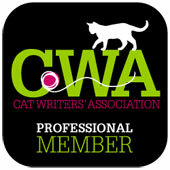 Did you know Thursday was National Answer Your Cat's Question Day? Me neither, until Magellan's human let Daddy Kiril know via twitter, hee, hee! 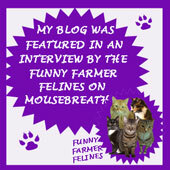 Magellan’s Burning Question was such a good one her human was asked to share it by Peggy Frezon of the blog Pawprints on My Heart. Well, last Sunday I asked Daddy a question that led to my first solo adventure of the new year! ME: Hey, Daddy, you DID remember to bring the leashes when we moved, right? DADDY KIRIL: You DO know it's been almost 9 months since you first wore the leash and went exploring for a few minutes? I wasn't too sure about this, at first...even though I was the one who brought the subject up. 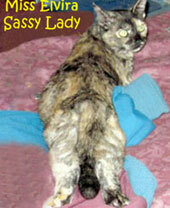 As you can see, by the shape, even my tail had doubts, hee, hee! The humans have a saying...be careful what you ask about...or something like that, I think. There was nothing for it but to harness the collective courage, daring and curiosity of the 8 Texian Tuxedos who came before me...and venture forth. We are just a day away from the move and between headless humans hanging out outside our window, Elvira walking around looking for a place to hunker down for the duration and Daddy Kiril packing boxes, doing last minute laundry and prancing around in his smiley face PJ's asking us "are you READY? "...things are getting weirder around here by the hour. Thank you to all who have sent us well wishes as we make this momentous change in our lives. Your support and encouragement mean a lot to all of us. 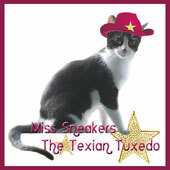 Happy Friday, felinity assembled, Sneakers the Texian Tuxedo, here! By next weekend Elvira Mistress of Felinity and I will be reporting from our new apartment and this weekend begins the final push as packing and cleaning picks up. We are all acting a bit weird, around here, this week...just to get into the spirit of the season, so says Daddy Kiril. What ever season he means it sure can't be Chrissymouse, hee, hee! He too me to the vet for my annual shots and check-up, plus getting my nails trimmed, and I was rather cranky with Dr. A and her assistants as they, um, eventually got me in a secure position to give me my shots and check-up. I liked the nail trim much better. Daddy spent Wednesday evening doing something he'd not done in over 2 years, since before he, Nikita and Elvira moved to Houston...standing on a stage in front of a bunch of his fellow humans and reading to them, while many of them had drinks...before, during and after he read to them. Elvira swears this was a cool thing and Daddy was smiling when he came home, so who am I to judge? Elvira says she will explain it to me sometime in the coming days. As for her...based on her own behavior, yesterday, this explanation had better be good!